Setlist: Pictures of Home - Things I Never Said - Hush - Rapture of the Deep - Strange Kind of Woman - Fireball - When A Blind Man Cries - Lazy - Don's solo~ Perfect Strangers - Highway Star - Space Truckin' - Smoke On The Water- Black Night. "Rock Under The Bridge is an annual 12 hour rock festival held near a suspension bridge connecting the island of Funen with Jutland, Denmark. For me - living a 3 hour train-ride away - the day was a bad case of waiting/killing time with various Danish bands (luckily the weather was great) just waaaaaiting for 10:45 PM when Deep Purple went on stage. But what can I say: it was worth waiting for. In fact I've been counting down since the end of April when I coincidentally discovered that I had the chance to go see Purple - my teenage favourites and whom I hadn't seen live since 1971 in Copenhagen! (at the age of 10 believe it or not) . In the past 6 weeks I've bought 4 DVD's and 11 CD's to catch up on all that I was missing (don't ask why missed it) - and I honestly and strongly feel that the guys have come such a long way, and are better than EVER. Setlist: Pictures of Home / Things I Never Said / Hush / Rapture of the Deep / Strange Kind Of Woman / Wrong Man / The Well Dressed Guitar / Fireball / When A Blind Man Cries / Lazy / Don Airey's solo ~ Perfect Strangers / Space Truckin´ / Highway Star / Smoke On The Water. Encores: Untitled (Inspired by the Blackmore-Montreux Rumours) / Black Night. "This show was perfect, and I have seen so many of them. They followed the setlist, but in every song there was something different - maybe the way Ian sang it, or the way the others played it. The first encore was absolutely remarkable, Ian Gillan wanted the audience to sing along with him while the rest of the band played along quietly. This was pure improvisation.......fantastic!!!!...... and by the lyrics you could understand where the inspiration came from: the rumour of Deep Purple playing with Ritchie Blackmore in Montreux. After the show I met the band and of course I asked about the rumours. Steve was to first to answer that if it was true (but it´s not) he could plan a vacation, Ian Gillan reacted that is was total nonsense and that he had called Claude Nobs about it. ´Funky Claude´ said the he was misquoted and that he just said that Deep Purple sometimes invite guest-musicians." Setlist: Pictures of Home / Things I Never Said / Hush / Rapture of the Deep / Strange Kind of Woman / Wrong Man / The Well Dressed Guitar / Fireball / When A Blind Man Cries / Lazy / Don Airey solo ~ Perfect Strangers / Space Truckin' / Highway Star / Smoke On The Water. Encores: Speed King / Black Night. Can you imagine how Deep Purple sound without the Hammond? Well, everybody who came to Osnabruck know. With Don's first touch the Hammond stopped functioning. That was the beginning of a very special evening. You could see the doubt on the faces of the band. After Pictures of Home Roger, Paicey and Steve started a little jam session, giving the roadies time to try to repair the Hammond (the return Mumblin' Thing Blues!) but Don felt it was kaputt for the night. So, they played on with Don using his other keyboards, and he did a wonderful job. Lazy and Space Truckin' on the piano, Fireball on the synthesizer and so on. (one for bootleg fans!) From time to time you could see the others looking at Don wondering with what he would come up with this time. Best song of the evening was The Well Dressed Guitar, Steve was so great that even his wife said later on that she was so proud of him this night. 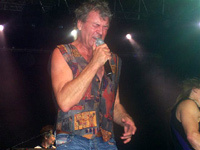 "The boys were back in town, or better said – in the “city of future“ as Gillan ironically described the venue during the show. However, framed by the giant excavators from past times the band was in absolutely brilliant condition. Spirits were high on stage and the Trinity of Gillan / Glover / Morse had the lion’s share of spreading the fun. The frontman joked that he had seen English footballers Crouch and Beckham in the crowd and later on he was temporarily barely able to sing due to laugher caused by some intentionally irritating sounds coming from Morse’s guitar. The setlist was the same as in Grefrath with the addition of a long and fulminating version of ”Speed King” complete with improvised snatches of old rock n'roll songs.. Even Elvis was covered. Pure madness. The one and only reason for criticism is well known: only three tracks from the recent album are definitely not enough to call it the Rapture Of The Deep Tour. I have no problem listening to the old classics. On the contrary, I adore them. But the band should add at least two more tracks from the current stuff. Set list: Pictures of Home / Things I Never Said / Strange Kind Of Woman / Rapture of the Deep / Fireball / Wrong Man / Contact Lost ~ Well Dressed Guitar (extended!) / Junkyard Blues / When A Blind Man Cries / Lazy / Don Airey solo (including Grieg and Star Wars theme) ~ Perfect Strangers / Space Truckin' / Highway star / Smoke On The Water. Encores: Hush ~ drum solo & one hand roll !! / Black Night with an amazing extended Steve Morse solo! Total time: 1 hour 45 mins. "Weather: Clouds, a few short rain showers, 12-13 degrees C, Audience : 5000. Yet again our friends delivered - an amazing and storming show! Very good sound. High quality playing all the way. 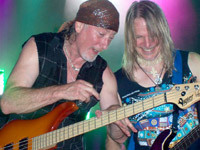 Especially Steve Morse, who was in playful mood, taking the rather poor weather into consideration. Early in the show they lost a good portion of the lighting rig, but it did not affect either them or the audience very much. The crowd were very responsive, and sang along to several of the older songs. The review in the local newspaper here in Trondheim ('Adressavisen') was very enthusiastic and started off with 'Deep Purple at Hell; Almost Legendary' . The three shows here in Norway so far (Tromsø, audience 3,500 indoor, Bodø 2,500 outdoor and Hell) have gone down very well, with excellent reviews all over. The only disapointment perhaps to them and all of us (fans) may be that the audiences should really have been larger. It may be some time before Deep Purple will make a visit like this again to Norway. 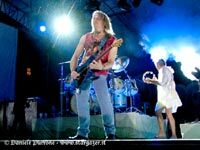 THANKS to Deep Purple, and to Hell Music Festival for another job well done!" 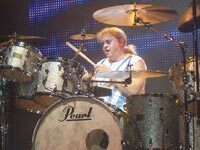 "I didn't get enough Deep Purple at 'Rock under Broen' 10th June so in a spur of the moment way I decided to fly to Bergen to see the show at Koengen, beautifully situated in the centre of Bergen. I heard a rumour that 'it always rains in Bergen', and, sure enough... it started gently but was soon raining cats and dogs. When Deep Purple came on it was horrible. Ian Gillan and Steve Morse looked especially apologetic, although obviously nobody would dream of blaming them... but after Pictures of Home and Things I Never Said Ian did the coolest thing: saying that it didn't seem fair that we were all soaking wet he poured an entire litre and a half bottle of still water over himself! Now there's solidarity for you! and everybody loved it. The weather may have been a real pain, but it seemed to make the band give even more... so it was a great show! Don cleverly included large parts of Edvard Grieg's Peer Gynt Suite in his solo and weather related songs like 'Raindrops Keep Falling on My Head', 'Singin' In The Rain' and even 'Here Comes The Sun' (!) popped up. Although there was great energy in the show I still feel that the setlist consists of too many seventies classics and too little new material. Outside Things I Never Said, we got Rapture of the Deep, The Well Dressed Guitar and Wrong Man. All in all, despite my horrendous air-fare and ruined sneakers it was worth the trip! These guys can still play rock'n'roll in such a no nonsense way that I can't think of anybody else I would rather go see." "They made the front page of the regional newspaper. Great picture! Look at Gillan!! Sunglasses, yellow swimming trunks and waterproof ! It seems they had some black-out problems, due to the pouring rain, judging from the title: SUPER CONCERT WITH BLACK-OUT PROBLEMS CROWD AT THE BRIAMASCO [the name of the stadium] FOR DEEP PURPLE. It seems the small stadium was 3/4 full, due to the rain they used really a small portion of the PA, hence the volume was extremely low. Gillan: without voice. Airey: anonymous. Morse: as always, take him or leave him. Paice: just another gig. Glover: the best. " Setlist: Pictures of Home / Things I Never Said / Hush / Rapture of the Deep / Strange Kind Of Woman / Wrong Man / The Well Dressed Guitar / Fireball / When A Blind Man Cries / Lazy / Don Airey's solo ~ Perfect Strangers / Space Truckin´ / Highway Star / Smoke On The Water. Encores: Untitled / Black Night. "Perfect weather, perfect mood. There was something special in the air, as Roger confirmed after the show. The crowd was very much on Purple's side. So they had a home run. 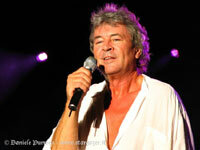 The sound was clear and powerful, and Ian Gillan sang very well. A very strong gig. The setlist was pretty much the same as in Trento the day before." "Rapture Of The Deep sees another towering performance, Steve taking centre stage for his solo as the first of many roses, plucked from the table decorations (I kid you not) start to rain down on the stage, a compliment I’m told but this did see the birth of a new dance, devised by Ian Gillan, who had taken to the stage without shoes and was doing some bizarre, Riverdance style moves to avoid the thorns. There’s something not quite working tonight, though. The band seems somewhat flat, probably due to the bizarre situation and unresponsive crowd. Gradually, though, as Steve solo gives over to Well Dressed Guitar, the crowd around us starts to warm and glances of disbelief are exchanged between people as things start to effervesce during the middle section of the song. The crowd, in turn, now start to pepper the stage with roses, the previous drizzle being replaced with a cloudburst of blossoms.."
read Martin Ashberry's full review. To see a gallery of photos from the shows, click on the photo above. 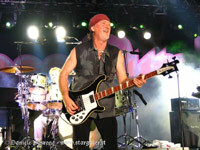 "I was on holiday in Greece when Deep Purple performed recently in Athens. What a great night! I've attached some photos i.e. two of the band on stage and one which shows the dramatic backdrop of the cliff face behind the stage. Hope they are of interest!" Steve Steinsberg, Manchester, UK.